Many of us have treasured t-shirts stashed away because we’re not ready to part with the faded and frayed reminders of past concerts, sports teams, road races, and places we’ve visited. So they stay, buried in the backs of drawers and packed away in attics, unlikely to be useful again. But then along comes Project Repat. The brainchild of Ross Lohr and Nathan Rothstein, Project Repat repurposes your favorite t-shirts into custom accessories such as tote bags, blankets, circle scarves and ties. You choose what you want to have made, and Project Repat tells you how many t-shirts you need to send. A few weeks later, you’ve got a one-of-a-kind item made from your own upcycled garments. But that’s just the beginning. Project Repat is about more than just repurposing your Frankie Goes To Hollywood t-shirt. The company is on a mission to turn textile waste into fair-wage job opportunities in the U.S. After learning how millions of donated t-shirts wind up in developing countries, where millions of entrepreneurial jobs revolve around the importing, distributing and selling of secondhand clothing, the founders of Project Repat were inspired to create a business model that employs U.S. workers to do the designing, piecing and sewing of your upcycled t-shirts. Treasured t-shirts make their way out of storage bins, U.S. workers find fair-wage jobs, and you get to enjoy the innovative results. Hey! 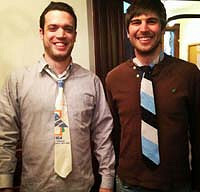 We are really excited to share with you our made in the USA upcycled t-shirt clothing accessories. We just launched our business earlier this year, but from the start we have cared deeply about creating products that are made by people making a fair and living wage in the USA. When you order a blanket, you are not only preserving your t-shirt memories, you are also helping create a job with dignity. If you have been waiting for the perfect gift to send your child off to college with, you have come to the right place, we have a PHD in t-shirt therapy! I love this!!! this is a great idea... I have over 20 t-shirts in my closet that I dont wear anymore. I will definitely make my purchase! @ Rawan Bannoura Thanks Rawan! We look forward to making something amazing for you out of those t-shirts. The content in your Story, Details and Comments sections has lately been very uneven, resolution-wise. Some of the letters are faded and and the overall quality of the type is faint. @ Carleton - Thanks for that feedback. We may be in direct contact with you to find out what browser and type of computer you use to view our site. When I used Google Chrome as my browser, I encountered the problems I mentioned in my last email. When I just used Mozilla Firefox as my browser, I encountered no such problems. I love Nathan Rothstein's project. Would it be possible to have him contact us. @ Marc Polish - We're glad that you're interested in Project Repat. I will forward your contact information to Nathan and edit it from this public posting. @ Marc Polish Thanks Marc-- we will be in touch! I have purchased a blanket and tote from these guys and both are amazing! I was nervous to send in my old bandshirts from highschool but, they did a geat job! I could not be more pleased with both my tote and blanket. In fact, I am sick today and I am wrappe up in my blanket! Thanks Project Repat! While trying to purchase the 5x5 blanket the coupon code is not working for me. It tells me "The discount does not meet the requirements set by the shop for this order." @ Marinda B - We will look into this and let you know! Thank You! My Order has been placed and I can not wait to have this blanket made! @Nathan Rothstein How do you determine the cost of the items? @ Barb Hardcastle: We do time studies and figure out what price we need to make a profit and also pay a living wage work for the workers. I am wondering about how you would deal with t-shirts in different sizes. I have a number of my daughter's t-shirts from birth up to a child's size 10-12 and have wanted to create a blanket from them for quite a while. Could you deal with these different sizes? 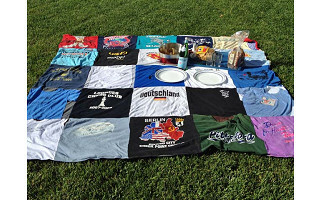 Would you be able to include more than 30 t-shirts to create a large size blanket (similar to your 5x5, but with more pieces)? I realize this would probably involve a custom quote but would definitely be interested. Please e-mail me if any of this sounds doable. @ Laura S - Nathan is away from his computer for a few minutes but wants to tell you that this is no problem. You can contact him directly at [email protected] to work through the details. I think this is such a great idea! My question is whether or not we can request specific things to be on the bag. For example, which shirts to be the main panel. Or, I have a shirt that has an emblem on the sleeve and I think this would make a cute inside pocket. @ Trisha -Nathan says that customizations are no problem. They will send you instructions once you place your order. Hi everyone! We've had a lot of questions about how the blankets are made - here is a quick overview! The way the blanket is constructed is by cutting a square foot out of the shirt and separating the front and back pieces. We put all of the 'fronts' of the shirts together to create one side of the blanket, then take all of the 'backs' of the shirts to create the other side. There is no batting in between layers, just both sides of the t shirts. But it is very warm and cozy - it feels more like a thick blanket and not a bed sheet. My daughter and I have purchased 4 items thus far from Project Repat, 2 bags and 2 circle scarves. The quality of each item is excellent, the service fantastic and when you submit your own t-shirts, they are displayed in the best possible way in the item you are purchasing. We definitely plan to buy more as gifts for family and friends. Great products. Great mission! I just ordered a blanket. I lost my husband in February at 60 years old. He had so many favorite t-shirts. I didn't want to part with them. Now I don't have to. Thank you so much for creating this idea. Can't wait to hear from you. Just ordered my first blanket! I'm excited to go round up our shirts...what a wonderful enterprise you guys have created. I like this, but I don't want to have the neckline or sleeves of my T-shirts included like you show in the photo. I just want squares cut from the logos--like a true quilt. Can I specify that when ordering? @ Heather Hi Heather- yes, we can make the t-shirt with just squares-- that blanket that was shown has some baby shirts, so that's why it looks that way. Can the blankets and bags be made out of sweatshirts? @ Trisha: Yes, we can do sweatshirts too. Grandpa just passed away. Can I use squares of his tee shirts, dress shirts, pants etc that I have cut up to make such a quilt? It does not matter if these are recut or the quilt size-just wanted to remember him and don't have the heart to get rid of all his things. @Sandy: We're very sorry for your loss. The RePat Project provides a wonderful way for you to remember & celebrate your grandpa. 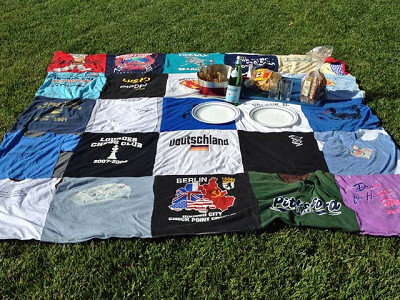 Nathan, our Grommet partner, says that they can create a quilt using t-shirts & sweatshirts only at this time. what is the back of the quilt made of? @ carla; The way the blanket is constructed is by cutting a square foot out of each shirt and separating the front and back pieces. We put all of the 'fronts' of the shirts together to create one side of the blanket, then take all of the 'backs' of the shirts to create the other side. There is no batting in between layers, just both sides of the t shirts, but the blanket is thick and warm. Many of us have treasured t-shirts stashed away because we’re not ready to part with the faded and frayed reminders of past concerts, sports teams, road races, and places we’ve visited. So they stay, buried in the backs of drawers and packed away in attics, unlikely to be useful again. But then along comes Project Repat. The brainchild of Ross Lohr and Nathan Rothstein, Project Repat repurposes your favorite t-shirts into custom accessories such as tote bags, blankets, circle scarves and ties. You choose what you want to have made, and Project Repat tells you how many t-shirts you need to send. A few weeks later, you’ve got a one-of-a-kind item made from your own upcycled garments. But that’s just the beginning. Project Repat is about more than just repurposing your Frankie Goes To Hollywood t-shirt. The company is on a mission to turn textile waste into fair-wage job opportunities in the U.S. After learning how millions of donated t-shirts wind up in developing countries, where millions of entrepreneurial jobs revolve around the importing, distributing and selling of secondhand clothing, the founders of Project Repat were inspired to create a business model that employs U.S. workers to do the designing, piecing and sewing of your upcycled t-shirts.